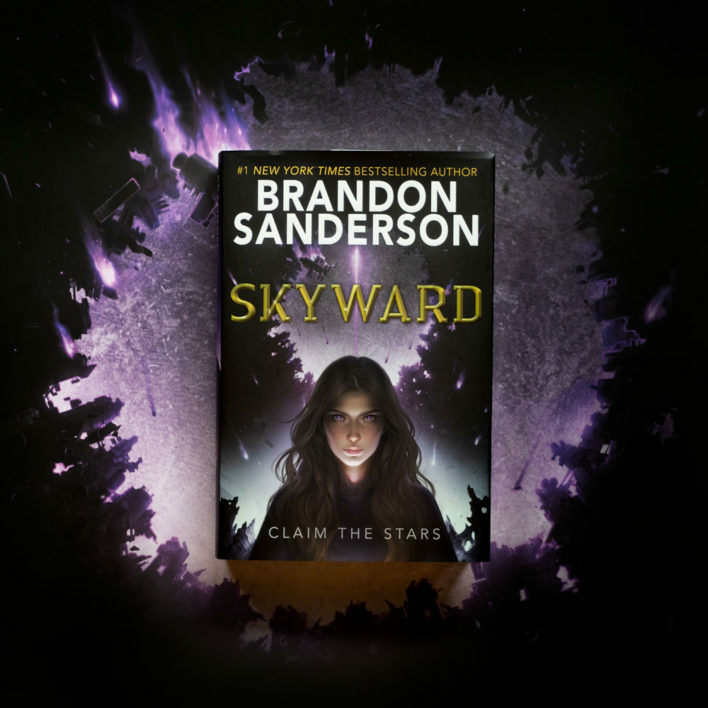 From Brandon Sanderson, the #1 New York Times bestselling author of the Reckoners series, Words of Radiance, and the internationally bestselling Mistborn series, comes the first book in an epic new series about a girl who dreams of becoming a pilot in a dangerous world at war for humanity's future. Spensa's world has been under attack for decades. Now pilots are the heroes of what's left of the human race, and becoming one has always been Spensa's dream. 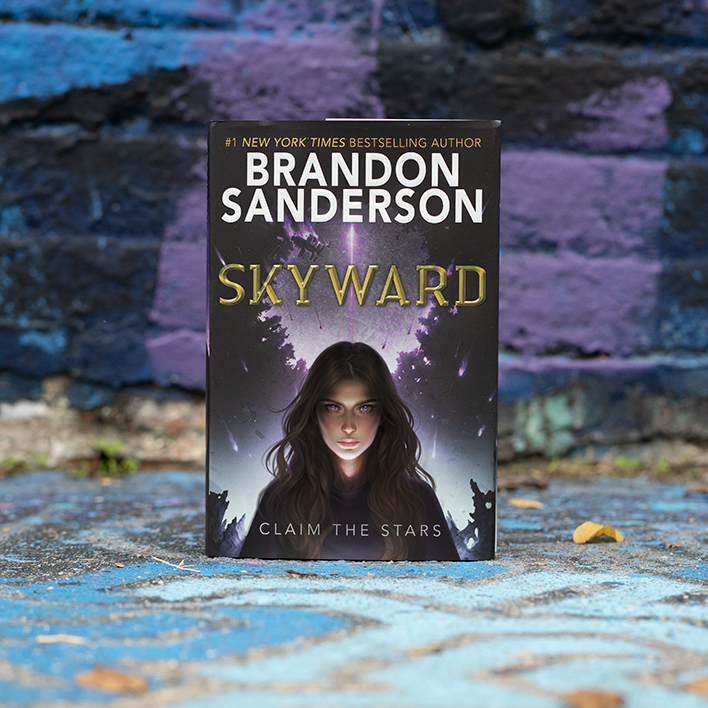 Since she was a little girl, she has imagined soaring skyward and proving her bravery. But her fate is intertwined with her father's--a pilot himself who was killed years ago when he abruptly deserted his team, leaving Spensa's chances of attending flight school at slim to none. I stalked my enemy carefully through the cavern. I’d taken off my boots so they wouldn’t squeak. I’d removed my socks so I wouldn’t slip. The rock under my feet was comfortably cool as I took another silent step forward. This deep, the only light came from the faint glow of the worms on the ceiling, feeding off the moisture seeping through cracks. You had to sit for minutes in the darkness for your eyes to adjust to that faint light. Another quiver in the shadows. There, near those dark lumps that must be enemy fortifications. I froze in a crouch, listening to my enemy scratch the rock as he moved. I imagined a Krell: a terrible alien with red eyes and dark armor. With a steady hand--agonizingly slow--I raised my rifle to my shoulder, held my breath, and fired. A squeal of pain was my reward. I patted my wrist, activating my father’s light-line. It sprang to life with a reddish-orange glow, blinding me for a moment. Then I rushed forward to claim my prize: one dead rat, speared straight through. In the light, shadows I’d imagined as enemy fortifications revealed themselves as rocks. My enemy was a plump rat, and my rifle was a makeshift speargun. Nine and a half years had passed since that fateful day when I’d climbed to the surface with my father, but my imagination was as strong as ever. It helped relieve the monotony, to pretend I was doing something more exciting than hunting rats. It turned out that strange little girls grow up to be strange young women. But I figured it was good to practice my taunts for when I really fought the Krell. Gran-Gran taught that a great warrior knew how to make a great boast to drive fear and uncertainty into the hearts of her enemies. I tucked my prize away into my sack. That was eight so far--not a bad haul. Did I have time to find another? I glanced at my light-line--the bracelet that housed it had a little clock next to the power indicator. 0900. Probably time to turn back; I couldn’t miss too much of the school day. I slung my sack over my shoulder, picked up my speargun--which I’d fashioned from salvaged parts I’d found in the caverns--and started the hike homeward. I followed my own hand-drawn maps, which I was constantly updating in a small notebook. A part of me was sad to have to return, and leave these silent caverns behind. They reminded me of my father. Besides, I liked how . . . empty it all was. Nobody to mock me, nobody to stare, nobody to whisper insults until I was forced to defend my family honor by burying a fist in their stupid face. I stopped at a familiar intersection where the floor and ceiling gave way to strange metal patterns. Circular designs marked with scientific writing covered both surfaces; I’d always thought they must be ancient maps of the galaxy. On the far side of the room, an enormous, ancient tube emerged from the rock--one of many that moved water between the caverns, cleansing it and using it to cool machinery. A seam dripped water into a bucket I’d left, and it was half full, so I took a long drink. Cool and refreshing, with a tinge of something metallic. We didn’t know much about the people who had built this machinery. Like the rubble belt, it had been here already when our small fleet crashed on the planet. They’d been humans, as the writings on places like this room’s ceiling and floor were in human languages. But how distantly related they were to us was a mystery even now. None of them were still around, and the melted patches and ancient wrecks on the surface indicated that they had suffered their own war. I poured the rest of the water into my canteen, then gave the large tube a fond pat before replacing the bucket and moving on. The machinery seemed to respond to me with a distant, familiar thrumming. I followed that sound and eventually approached a glowing break in the stone on my left. I stepped up to the hole and looked out on Igneous. My home cavern and the largest of the underground cities that made up the Defiant League. My perch was high, providing me with a stunning view of a large cave filled with boxy apartments built like cubes splitting off one another. My father’s dream had come true. In defeating the Krell that day over nine years ago, those fledgling starfighter pilots had inspired a nation. Dozens of once-nomadic clans had congregated, colonizing Igneous and the caverns around it. Each clan had its own name still, traced back to the ship or section of the ship they’d worked on. My clan was the Motorskaps--from the old words for engine crew. Together, we called ourselves Defiants. A name taken from our original flagship. Of course, in gathering together, we had drawn the attention of the Krell. The aliens were still determined to destroy humankind, so the war continued, and we needed a constant stream of starfighters and pilots to protect our burgeoning nation. Towering over the buildings of Igneous was the apparatus: ancient forges, refineries, and manufactories that pumped molten rock from below, then created the parts to build starfighters. The apparatus was both amazing and unique; though machinery in other caverns provided heat, electricity, or filtered water, only the apparatus of Igneous was capable of complex manufacturing. Heat poured through the crack, making my forehead bead with sweat. Igneous was a sweltering place, with all those refineries, factories, and algae vats. And though it was well lit, it somehow always felt gloomy inside, with that red-orange light from the refineries shining on everything. I left the crack and walked to an old maintenance locker I’d discovered in the wall here. Its hatch looked--at first glance--like any other section of the stone tunnel, and so was relatively secure. I popped it open, revealing my few secret possessions. Some parts for my speargun, my spare canteen, and my father’s old pilot’s pin. I rubbed that for good luck, then placed my light-line, map book, and speargun in the locker. I retrieved a crude stone-tipped spear, clicked the hatch closed, then slung my sack over my shoulder. Eight rats could be surprisingly awkward to carry, particularly when--even at seventeen--you had a body that refused to grow beyond a hundred and fifty-one centimeters. I hiked down to the normal entrance into the cavern. Two soldiers from the ground troops--which barely ever did any real fighting--guarded the way in. Though I knew them both by their first names, they still made me stand to the side as they pretended to call for authorization for me to enter. Really, they just liked making me wait. Every day. Every scudding day.